Box-Toppers highest-ranked pitchers in each league for the season were selected Wednesday as 2013‘s Cy Young Award winners. Dodgers pitcher Clayton Kershaw was chosen as National League Cy Young Award winner. He led all players in Box-Toppers points for the season with 21.7. Tigers pitcher Max Scherzer was chosen as American League Cy Young Award winner. He led all AL pitchers in Box-Toppers points with 18.1. He ranked fifth among all players. Voting by the Baseball Writers Association of America for the Cy Young Award for top pitcher coincided, generally, with Box-Toppers Player Rankings. There were some anomalies and snubs. Patrick Corbin of the Diamondbacks. He had 17.4 Box-Toppers points and ranked fifth among all NL pitchers. Corbin briefly led all players in Box-Toppers rankings in July. Justin Masterson of the Indians. He had 16.4 Box-Toppers points and ranked third among all AL pitchers and 10th among all players. Masterson led all players in Box-Toppers points at five different times in the season, including being the overall leader for nearly a month from July 21 to Aug. 17. He led all AL pitchers in Box-Toppers points until Sept. 15, when he was finally passed by Scherzer. True, Masterson did not pitch much or pitch well down the stretch. His last Box-Toppers Player of the Game honor came on July 27. Still he was the player who most helped his team win 11 games—more than many pitchers who received votes—and should have been given some consideration among voters. Lance Lynn of the Cardinals. He had 16.1 Box-Toppers points and ranked seventh among all NL pitchers. Shelby Miller of the Cardinals. He had 15.4 Box-Toppers points and ranked ninth among all NL pitchers. Ubaldo Jimenez of the Indians. He had 14.5 Box-Toppers points and ranked ninth among all AL pitchers. Closing pitchers were another anomaly. In Box-Toppers scoring, closing pitchers often rank lower in player rankings, as they are less likely than starters to be the player who most helps his team win the game—and thus earn Player of the Game honors and Box-Toppers points. So in the American League, Red Sox closer Koji Uehara ranked seventh among AL pitchers in voting but ranked 52nd in Box-Toppers points (with 6.0). In the NL, Braves closer Craig Kimbrel finished fourth in voting and 17th in Box-Toppers points among NL pitchers (with 12.7). Here are the results of Cy Young Award voting in both leagues. Players are listed in order of their vote total. The far right columns show how many Box-Toppers points (BTP) they earned during the 2013 season and how each player ranked in Box-Toppers points among pitchers in their league. * Rank among pitchers in the league (AL or NL) in Box-Toppers points for the 2013 season. Marlins pitcher Jose Fernandez led the way in voting and in Box-Toppers points on the way to earning National League Rookie of the Year Monday. But the player voted American League Rookie of the Year ranked fourth among AL rookies in Box-Toppers points, behind a teammate. Wil Myers of the Rays, who served as designated hitter and right fielder, was voted top AL rookie, though his teammate, pitcher Chris Archer, had the most Box-Toppers points among AL rookie vote-getters. Fernandez, who ranked fourth among all players, briefly led in Box-Toppers overall player rankings in September. He finished with 19.0 Box-Toppers points, in fourth place among all NL players and more than any other AL player. Dodgers rightfielder Yasiel Puig finished second in voting, though he only earned 1.5 Box-Toppers points during the season. The National League featured strong rookie pitchers among the top vote-getters. Shelby Miller of the Cardinals (third in voting) had the second-most Box-Toppers points among rookies with 15.4. Julio Teheran of the Braves (fifth in voting) had the third-most Box-Toppers points among rookies with 13.7. Hyun-Jin Ryu of the Dodgers (fourth in voting) had 9.7 Box-Toppers points. Archer far outdistanced all other AL rookies in Box-Toppers points, though he was only voted in third place. Archer had 11.7 Box-Toppers points. Myers, who finished first, had 3.5 Box-Toppers points, tied for the most among AL batters in rookie voting. Tigers shortstop Jose Iglesias (who earlier in the season played for the Red Sox) finished in second in voting, though he earned no Box-Toppers points. In fact, two rookie vote-getters, Iglesias and Rockies third baseman Nolan Arenado, have yet to earn Box-Toppers Player of the Game honors and so neither have any Box-Toppers points. One other notable rookie, Athletics pitcher Dan Straily finished fourth in AL rookie voting. He had 7.7 Box-Toppers points, the second-most among AL rookie vote-getters. May 4: Player of the Day, 2.0 BTP. June 1: Player of the Day, 2.0 BTP. June 14: Player of the Game, 1.0 BTP. July 1: Player of the Day, 2.0 BTP. July 23: Player of the Game, 1.0 BTP. July 28: Player of the Day, 2.0 BTP. Aug. 2: Player of the Day, 2.0 BTP. Aug. 13: Player of the Day, 2.0 BTP. Aug. 19: Player of the Game, 1.0 BTP. Aug. 24: Player of the Day, 2.0 BTP. Sept. 6: Player of the Game, 1.0 BTP. June 7: Player of the Game, 1.0 Box-Toppers point. July 9: Player of the Game, 1.0 BTP. July 14: Player of the Day, 2.0 BTP. July 27: Player of the Day, 2.0 BTP. Aug. 18: American League Player of the Day, 1.7 BTP. Aug. 28: Player of the Day, 1.0 BTP. Sept. 13: Player of the Day, 2.0 BTP. July 19: Player of the Game, 1.0 Box-Toppers point. Aug. 15: American League Batter of the Day, 1.5 BTP. Here are the results of Rookie of the Year voting in both leagues. Players are listed in order of their vote total. The far right column shows how many Box-Toppers points (BTP) they earned during the 2013 season. For more: MLB.com’s coverage of the vote. * Jose Iglesias began the season playing for the Red Sox. Shane Victorino helped the Red Sox wrap up a World Series title Wednesday, earning Player of the Day honors in the deciding Game 6. Victorino, with two hits, including a three-run double, led the Red Sox to a 6-1 win over the Cardinals in Game 6 and sealing a 4-2 game victory in the series. Victorino went 2-for-3 in the game and drove in four runs. He had 4.5 Box-Toppers points during the regular season, ranking 224th overall. Victorino was also Player of the Day in the deciding Game 6 of the American League Championship Series, in which the Red Sox beat the Tigers 5-2. Thanks for following Box-Toppers this season. Stay tuned via RSS, Twitter or Facebook for offseason posts to follow postseason player awards, season wrap-ups and other odd bits of essential knowledge and/or trivia. Here are the top six Red Sox players in Wednesday's World Series Game 6, ranked from highest to lowest Box-Toppers game score (how game score is calculated). Shane Victorino, who had a Box-Toppers game score of 3.0, is Box-Toppers Player of the Game (POG). Jonny Gomes hit a three-run homer to lead the Red Sox to a Game 4 World Series win, earning Sunday's Box-Toppers Player of the Day honors. The Red Sox beat the Cardinals 4-2 to even the best-of-seven World Series at two games apiece. Gomes, starting in place of an injured Shane Victorino, had 5.5 Box-Toppers points during the regular season, ranking 156th overall. Red Sox: Jon Lester, 12.7 Box-Toppers points, ranked 34th overall. Cardinals: Adam Wainwright, 20.2 Box-Toppers points, ranked second overall. This is a rematch of World Series Game 1, won by the Red Sox 8-1. Lester was Player of the Game. Both players are their team's overall leader in Box-Toppers points. Here are the top six Red Sox players in Sunday's World Series Game 4, ranked from highest to lowest Box-Toppers game score (how game score is calculated). Jonny Gomes, who had a Box-Toppers game score of 3.0, was Player of the Game (POG). He edged out middle relief pitcher Felix Doubront, who had a game score of 2.2, and who picked up the win. Red Sox pitcher Jake Peavy matches up against Cardinals pitcher Joe Kelly in Game 3 of the World Series Saturday. Peavy had 8.0 Box-Toppers points during the regular season, ranking 84th overall. Kelly had 4.0 points, ranking 264th overall. The best-of-seven series is tied at one game apiece as it moves to St. Louis for Game 3. Cardinals closer Trevor Rosenthal is Thursday's Player of the Day, earning the save in Game 2 of the World Series. Rosenthal pitched the ninth inning and struck out three in the 4-2 win over the Red Sox. The Cardinals tie the Red Sox at one game apiece in the best-of-seven World Series. Rosenthal had 6.0 Box-Toppers points during the regular season, ranking 147th overall. It is the first time this postseason he has earned Player of the Game honors. The World Series moves to St. Louis for Game 3 Saturday. Here are the top four Cardinals players in Thursday's World Series Game 2, ranked from highest to lowest Box-Toppers game score (how game score is calculated). Trevor Rosenthal, who had a Box-Toppers game score of 4.0, was Player of the Game (POG). Middle reliever Carlos Martinez also had a game score of 4.0, but Rosenthal was named Player of the Game because he picked up the save. With the Red Sox and the Cardinals matched up against each other for the fourth time in World Series history, let's take a Box-Toppers look back to the last time they faced off, in the 2004 Fall Classic. Red Sox designated hitter David Ortiz. Ortiz had 10.7 Box-Toppers points during the 2004 regular season, his best at the time and was Player of the Game in two postseason contests—once in Game 4 of the American League Championship Series against the Yankees and once in Game 1 of the World Series against the Cardinals. This season, Ortiz had 12.4 Box-Toppers points and has already been Player of the Game in Game 2 of the ALCS vs. the Tigers. Molina was in his first year with the Cardinals in 2004 and had only 1.0 Box-Toppers point. He was playing behind then-starting catcher (now Cardinals manager) Mike Matheny. This season, Molina has 4.0 Box-Toppers points. One other current Cardinal player did play a prominent role in 2004's postseason. Carlos Beltran, then of the Astros, was twice Player of the Game during the National League Division series, as the Astros defeated the Braves, three games to two. The Astros lost to the Cardinals in the NLCS, four games to three. The 2004 postseason was also notable because it was the first and only time a team with a 3-0 game deficit in a best-of-seven series came back to win it 4-3. That was the Red Sox, beating the Yankees in the ALCS, sparked by Ortiz' Game 4 performance. Ortiz hit a walk-off, 12th-inning, two-run home run to beat the Yankees 6-4. The Sox then trailed that series three games to one. Game 1: Ortiz, who has 126.4 Box-Toppers points for his career, ranked 24th all-time (since 1995 when Box-Toppers record-keeping began). Game 2: Pitcher Curt Schilling, who had 21.0 Box-Toppers points in 2004 and has 194.1 since 1995, ranked third on the all-time (since 1995) list. Game 3: Pitcher Pedro Martinez, who had 17.1 Box-Toppers points in 2004 and has 244.8 since 1995, ranked second on the all-time (since 1995) list, behind only Randy Johnson (278.8). Game 4: Pitcher Derek Lowe, who had a career-low 1.0 Box-Toppers point in 2004, but has 91.5 for his career, ranked 82nd on the all-time list. Here are Box-Toppers Players of the Games for each of the league division series games played in 2004. Games are listed by day. The Red Sox beat the Angels 3-0. The Yankees beat the Twins 3-1. The Cardinals beat the Dodgers 3-1. The Astros beat the Braves 3-2. Here are Box-Toppers Players of the Games for each of the league championship series games played in 2004. The Red Sox beat the Yankees 4-3. The Cardinals beat the Astros 4-3. Here are Box-Toppers Players of the Games for each of the World Series games played in 2004. The Red Sox beat the Cardinals 4-0. In the first column of each chart, the designation MLB indicates Player of the Day, AL or NL indicates Player of the Day in the opposite league and BAT indicates the player was the top batter of the day in his league. Usually, top players of the game receive 1.0 Box-Toppers point, top batters in the league receive 1.5, top players in the league receive 1.7 and top overall players receive 2.0. 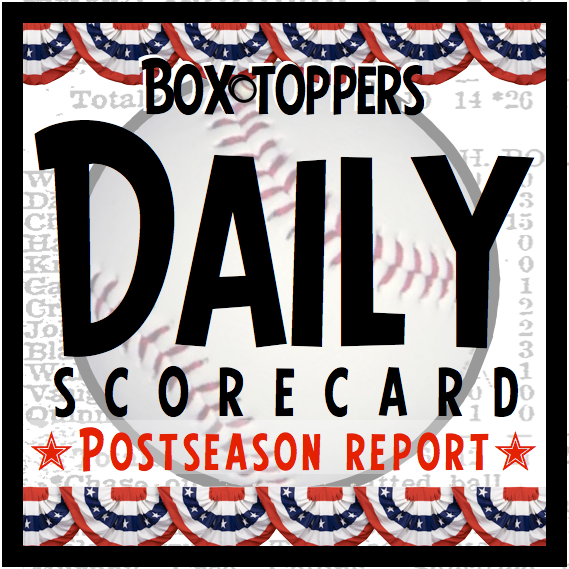 However, postseason Box-Toppers points are not counted in regular season Box-Toppers totals. The Box-Toppers All-Star teams for the 2013 regular season are led by overall top player, Dodgers pitcher Clayton Kershaw. The Washington Nationals have the most representatives of any team, with four players. The All-Star teams are comprised of the players with the highest Box-Toppers point totals by position in each league. In addition to the batters—eight in the National League and nine (including the designated hitter) in the American League—are the top four starting pitchers in each league, the top player who was predominately a middle-reliever and the top closing pitcher. Kershaw was Box-Toppers Player of the Season, the top overall player, with 21.7 Box-Toppers points. The top four overall players were starting pitchers from the NL. Tigers pitcher Max Scherzer is the top AL player with 18.1 points, ranked fifth overall. The top AL batter is Tigers third baseman Miguel Cabrera with 16.9 points, ranked eighth overall. The top NL batter is Diamondbacks first baseman Paul Goldschmidt with 13.7 points, ranked 22nd overall. Shortstop Ian Desmond with 5.5 Box-Toppers points, ranked 163rd overall. Third baseman Ryan Zimmerman with 9.2 points, ranked 66th. Catcher Wilson Ramos, 7.5 points, ranked 101st. Outfielder Bryce Harper, the third-ranked outfielder, with 9.4 points, ranked 65th overall. AL designated hitter David Ortiz of the Red Sox has 12.4 Box-Toppers points, ranked 36th overall. NL starting pitcher Adam Wainwright of the Cardinals has 20.2 Box-Toppers points, ranked second overall. Box-Toppers is set up to determine the players who most help their team win the most games. Top players from the winning team of each game are determined by a formula using standard box score statistics. These top players earn 1.0 Box-Toppers point for being Player of the Game. Among each day's top players, bonus points are awarded for the top players and batters of the day in each league. Players accumulate points through the season to provide a data point for comparison, such as determining which players are most worthy as All-Stars. Michael Wacha pitched the Cardinals into the World Series, dominating the Dodgers in Game 6 of the National League Championship Series, earning Friday's Box-Toppers Player of the Day. Wacha pitched seven shutout innings and gave up only two hits in the 9-0 win over the Dodgers, to win the NLCS for the Cardinals four games to two. It is the second time during the NLCS and the third time during the postseason that the rookie Wacha has earned Player of the Game honors. In the regular season, he only earned Player of the Game honors twice—both times in September—earning 3.0 Box-Toppers points during the regular season, ranking 361st overall. By contrast, the Dodgers starter Friday, Clayton Kershaw, is Box-Toppers Player of the Season, earning 21.7 Box-Toppers points, more than any other player. However, Kershaw lasted only four innings, gave up 10 hits and seven runs. Wacha also outdueled him in Game 2 of the series. Of course, with the Dodgers eliminated from the postseason, it means that Box-Toppers' preseason pick for World Series champion will not come to fruition. On paper—or rather in Box-Toppers' database—the Dodgers looked like the most dominant going into the 2013 season. But early on, they languished and seemed doomed for the NL West basement. However, in June, they began winning and by July were finally among Box-Toppers' top 10 teams and topped all teams for two weeks in September. They finished the season as Box-Toppers' second-ranked team, just behind the Tigers. This is a rematch of Game 2 of the series, won by the Red Sox, 6-5. Here are the top six Cardinals players in Friday's National League Championship Series Game 6, ranked from highest to lowest Box-Toppers game score (how game score is calculated). Michael Wacha, who had a Box-Toppers game score of 9.0 was Player of the Game (POG). Carlos Beltran was top batter with a Box-Toppers game score of 2.0. Adrian Gonzalez hit two home runs to keep the Dodgers alive in the National League Championship Series and is Wednesday's Box-Toppers Player of the Day. Gonzalez, who also went 3-for-4 and scored three times, led the Dodgers to a 6-4 win over the Cardinals in Game 5 of the NLCS. The Cardinals now lead the best-of-seven series three games to two as the series returns to St. Louis for Game 6 on Friday. Gonzalez had 5.0 Box-Toppers points during the regular season, ranking 175th among all players. Meanwhile, Austin Jackson of the Tigers is Box-Toppers Player of the Game in the American League Championship Series Game 4. Jackson went 2-for-2, walked twice and drove in two runs in the 7-3 win over the Red Sox, to tie the best-of-seven ALCS at two games apiece. Game 5 is Thursday in Detroit. Jackson had 1.0 Box-Toppers point during the regular season, ranking 576th overall. John Lackey, who threw 6 2/3 shutout innings and struck out eight, leading the Red Sox to win Game 3 of the American League Championship Series, is Tuesday's Box-Toppers Player of the Day. The Red Sox won 1-0 to take a two-games-to-one lead in the best-of-seven ALCS series. Lackey had 6.0 Box-Toppers points during the regular season, ranking 148th among all players. Meanwhile, Matt Holliday of the Cardinals is Box-Toppers Player of the Game in the National League Championship Series Game 4. Holliday hit a two-run home run and went 2-for-4 in the Cardinals 4-2 win over the Dodgers. The Cardinals take a three-games-to-one lead over the Dodgers in the NLCS. Holliday had 6.5 Box-Toppers points during the regular season, ranking 121st among all players. Greinke picked up a no-decision in the Dodgers' Game 1 loss. Dodgers pitcher Clayton Kershaw (21.7 Box-Toppers points, ranked first) picked up the loss in Game 2. Cardinals pitcher Adam Wainwright (20.2 Box-Toppers points, ranked second) picked up the loss in Game 3.